Sysomos has just released extensive research on Twitter use, filled with all sorts of fascinating information, such as 72% of Twitter users have joined since the beginning of this year, 53% of Twitterers are women, and marketers are 50 times more likely than normal people to follow over 2000 people. 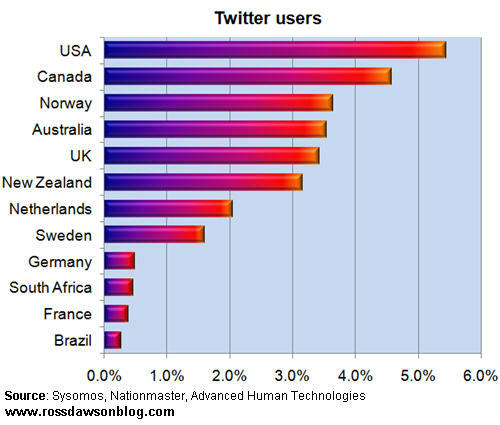 I am always interested in comparing countries, so I pulled out and analyzed their statistics on where Twitter users are located to calculate the proportion of the population that are use Twitter. I used the Sysomos data on Twitter usage, the ever-handy Nationmaster for population figures, and a combination of the recent http://rossdawsonblog.com/weblog/archives/2009/04/at_current_grow_1.html combined with Sysomos data on recent growth, as well as our own estimates. The US is in the lead, not surprisingly, though by a far lower margin than even just six month ago. The global growth of Twitter has accelerated recently, making usage in a number of other countries not far behind that of the US. The English speaking countries – Canada, Australia, UK and New Zealand – follow close behind, with Norway the stand-out in non-English speaking countries, together with the Netherlands and Sweden. The figures suggest Twitter is a truly niche interest in other countries, including France and Germany. One of the other particularly interesting parts of the report was the use of publishing tools. I’m surprised to learn that over 50% of tweets are from the web, with Tweetdeck by far the leading desktop Twitter client. Tweetie and Twitterfon lead in mobile Twitter apps.